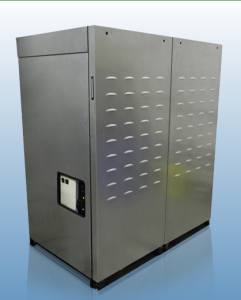 The highly efficient PureCell® Model 5 system generates 5 kW of assured electrical power, plus 21,000 Btu/hour of heat output for combined heat and power (CHP) applications. Typical market sectors include data centers, restaurants, retail outlets, hotels, fitness centers, multi-family residential buildings, supermarkets and other facilities with continuous baseload power and thermal energy requirements. The Model 5 system generates thermal energy in the form of “low” grade heat. This heat can be utilized in boilers, pools, hot tubs, radiant flooring and space heating, further offsetting a customer’s energy costs. The Model 5 offers customers energy density and location flexibility. It can be installed outdoors or indoors, from basements to rooftops and requires a fraction of the area and volume required by equivalent solar/wind systems. For increased energy output, individual systems can be arranged side-to-side and back-to-back to minimize site footprint. More than half of the energy potential in traditional, centralized power generation goes up the stack as exhaust heat. The Model 5 system converts heat exhaust into heating, turning potential waste into useable energy. While central powerplants achieve percentages in the mid-30s, Model 5 systems offer up to 90% system efficiency and run on standard pipeline natural gas. The PureCell® Model 5 system operates steadily, 24 hours per day, 7 days per week. Because it operates around the clock and is not affected by weather or time of day, the Model 5 is a strong fit for customers with smaller baseload power requirements. The system can operate independent of or in parallel with the electric grid, making it a critical power backup during natural disasters, man-made emergencies and grid fluctuations. To ensure your peace of mind, the system is remotely monitored for functionality, ensuring your business has reliable power. Sound Level 60 dBA @ 3 ft.